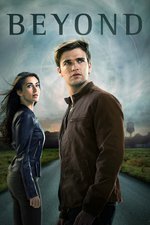 In the series premiere, a man wakes up after 12 years in a coma to discover he's gained supernatural abilities. *Teenager Holden goes to meet his friend, Kevin, to drink beer and watch for meteors atop a water tower. When Kevin's brother, Jeff, shows up and starts bullying Kevin, Holden tries to defend him (clocking Jeff in the head with his bike helmet) then a car/scooter chase ensues. When Holden escapes off-road, he gets clocked by a tree branch. After a moment of rocks and things floating magically around him there is a blinding white light, then he wakes in the hospital from his 12-year coma, in mysteriously miraculous physical condition. *That night Holden dreams of an old man reaching out to him, a woman saying "see you soon", and flames, then awakes in the forest where he fell into the coma. *At the hospital, Dr. Warren finds her office has been ransacked. When the police investigate, she tells them she suspects whoever did it was after Holden's file. *Luke takes Holden out clothes shopping. When Holden sees a beautiful woman, Luke encourages him to go talk to her; he dorks out, but when he starts to slink away she grabs his arm and writes "you're in danger trust no one" on it. *That night Holden dreams of the old man in the flames again, saying "Do it, Holden, don't be afraid" and of the mystery woman saying "they're coming for you", as the lights in his bedroom flicker, and wakes in forest again. *Holden goes to see Kevin in his office at school where he does counseling while reworks on his doctorate. *At the hospital getting an MRI, Holden goes into a dream state again, causing the lights to go off, and the computers to catch fire. *At home Kevin gets a call from someone demanding he find out what Holden knows (or something.) Unknown caller then calls a man in a yellow jacket who is in the process of breaking into someone's (Kevin's?) desk, telling him that Kevin has failed and that he needs to find out if Holden is the one. *Kevin meets Holden at a bar and warns him that someone is coming for him. When Holden runs out in a panic and Kevin follows, Yellowjacket and 2 goons attack. Yellowjacket threatens that they will shoot Kevin unless Holden stops the bullet, and when Holden punches the pavement a telekinetic shockwave flings the 3 bad guys through the air. The mystery woman arrives and races Holden away in her van. *She tells him her name is Willa and that she'll take him away somewhere safe, but Holden insists he needs to go back to his family, and when she refuses to stop, he blows out the car windows with another surprise telekinetic fist to the car armrest. Willa tells him that while his body was in a coma his consciousness was living a life and she was with him. She tells him that he has dangerous powers he has to control, and that she can show him the life he always wanted, but Holden walks away. *Willa goes to the bedside of the old man from the dreams, as he sleeps under high-tech monitors, and tells him that Holden isn't ready and doesn't remember. The comatose man replies via text on her phone, telling her to keep close and protect Holden. *Back in Holden's bedroom, he dreams again, as we see the room's lights flicker madly, the wind rushing, and the bobblehead heads on his shelf melt into a puddles of plastic goo. Wondering if anyone else watched this. I'm curious to see where it's going (but not curious enough to sit through ads trying to stream it on the app, or to sign up for Hulu). I figured this might be my kind of genre schlock from the promo; after watching this episode and the next I'm kinda 'meh' on it. I have no idea how old anyone is supposed to be or what year it is/was. Like, I guess Holden was supposed to be just starting high school pre-coma from his water-tower conversation with Kevin, which would make him 27-ish now? But if Luke is supposed to be 17 now (which seems a little young for college) he would have been 5 in the opening scenes, which, wasn't that child-actor way older than 5? And why give us close-ups of the puppy on Holden's bed if they weren't going to show an old dog in the present? And why would Holden be all "why is there a store for selling apples?" about the Applestore if he went into the coma in 2004, they were around before then. So, anyway, it seems kind of sloppy and derivative, but I got kind of a Kyle XY vibe, so, I will probably keep watching. It's another one (like Travellers) that I watched the first episode, and decided I won't be coming back for more. There just wasn't anything to hook me. And you're right about some of the age/time issues: PhD friend, for example seemed too young for that type of degree. Additionally, the mix (purposeful misdirection?) between is this the result of a sci-fi/alien abduction story line or a mystical/magical one (which seems to be where it's actually going) did nothing to cement my interest. Travelers was a well-constructed show though - I don't mean that in a 'you gotta watch it!' way, just that I think the writers did the work of breaking the stories and planning when to reveal each piece of the puzzle so that the finale would leave one going "oh, now I get it!" rather than "well, that doesn't make any sense." Nothing in this episode or the next gives me any faith that this show's writers will be able to pull off such a trick. But I will most likely keep watching as it broadcasts, if there isn't too much else on. Some of the visuals are cool, and I'm kind of morbidly fascinated to see whether the writing improves or if it will be a train wreck through and through. Like, I'm wondering if there was some massive re-tooling done in post-production - Luke's "I'm 17" line to Holden was off-screen dialogue while the camera was on the reaction shot of the parents down the stairs. If it had been a mistake, it could have have been fixed in ADR, which means either they looped it in on purpose because they for some reason thought it was important to have Luke be a 17-year-old underage-drinking college student, or they are just bad writers who can't do math. OK I came here to see if I should bother watching this show. Seems like I should save myself the trouble. Thanks for the heads up. I don't mean to derail into Travelers, but that was way better than this. Not a great show, but enough interesting characterizations to keep me coming back for the whole season. This had.....no interesting characters! They didn't do one thing to make me care about any of them. And I hate it when there is NO "in-show" reason for characters to withhold information, but they do, for "mystery" and/or plot reasons. This show is chock full of characters who know more than the protagonist, and never clue him in on anything. This was a disappointment, for sure.